The Iranian Nuclear Agreement: What Does it Mean for US Diplomacy and International Trade in the Middle East? 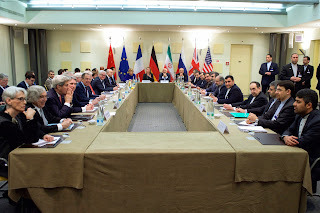 On April 2nd, the members of the P5+1, the European Union, and Iran reached an agreement on the framework for a Joint Comprehensive Plan of Action (JCPOA) regarding Iran’s nuclear program, outlining a set of parameters for a final agreement to be drafted by June 30th. Although a final comprehensive deal palatable to all parties will prove to be difficult, this framework agreement marks a milestone achievement in negotiations that have spanned over a decade. The nuclear accord faces resistance, however, by lawmakers in both the US and Iran, as it would require a broad leap of faith between two countries that have been at odds for over thirty years and have competing national interests in the region. An agreement with Iran would also call into question existing US alliances in the Middle East and lead to increased Russian influence in the region. News of the agreement evoked mixed reactions from US lawmakers, with the Senate drafting a bipartisan bill that would allow Congressional oversight on the final deal. President Obama agreed to sign the existing bill, allowing a hold on lifting sanctions during a 30-day congressional review of the final accord. Nevertheless, both President Obama and Secretary of State John Kerry stated that they would not allow Congress to stand in the way of the best deal possible. Many US lawmakers are hesitant to believe that the Iranian government will abide by its obligations under any agreement regarding the nuclear program, and their mistrust was exacerbated by the discrepancies between the fact sheets issued by the US and Iranian governments regarding the framework agreement. The US fact sheet states that Iran will reduce the number of installed centrifuges to 6,104 IR-1s (Iran’s first-generation centrifuge) to lengthen Iran’s breakout time to one year (versus 2-3 months). Furthermore, IAEA inspections would be conducted on all of Iran’s nuclear facilities, and access would be provided for UN inspectors to examine suspicious sites and investigate any allegations of covert facilities. Should the IAEA confirm that Iran has held up its end of the final comprehensive deal, US and EU nuclear-related sanctions would be suspended. The framework also references a restructuring of UN Security Council resolutions in order to lift the past resolutions regarding the nuclear issue. Yet, other US sanctions and UN resolutions related to terrorism, ballistic missiles, human rights violations, and cargo inspections would remain in force. Contrary to the US fact sheet, Iran’s fact sheet states that sanctions will be lifted at the time of the agreement, Iran will keep operating 10,000 centrifuges and not allow inspections of military sites, the Fordow site will continue enrichment activities, and the limits on the nuclear program will remain in effect for only 5 years. Iranian President Hassan Rouhani acknowledged that drafting the final deal would prove to be the true hurdle of the negotiations, but highlighted that the advancement of negotiations to this late stage reflected an international commitment to the process. Meanwhile, other Iranian politicians expressed their frustration with the reaction from Congress and Iran’s lack of recourse should the P5+1 fail to meet their obligations under the deal. Analysts in the US remain optimistic that all parties will come to a deal through “creative negotiations” and speculated that the Iranian fact sheet was prepared by Iranian hardliners in response to the proposed US Congressional review of the agreement. The framework agreement currently enjoys broad support from Iranian civil society as it promises the possibility of sanctions relief and economic growth. Sanctions relief should stabilize the foreign exchange rate and inflation, boost foreign private sector investments and domestic job creation, and increase foreign trade as businesses anticipate a sharp rise in economic and financial activity. Resuming oil production and exports will increase Iran’s hard currency revenues and should theoretically also revitalize its economy. This will ideally entrench the power of Iran’s moderates upon whom rest any hope of positive US-Iran relations in the coming years. The prospect of a nuclear deal seemingly threatens Saudi Arabia, who believes that positive US-Iranian diplomatic relations and sanctions relief will lead to Iranian crude exports driving down oil prices and revenues, and fears that its long-standing alliance with the US will be in jeopardy. A change in oil prices is unlikely, however, as analysts believe that, while Iran should be able to export up to 500,000 barrels of crude oil per day by early 2016, the steady increase in global demand for oil should prevent this influx from impacting prices. Despite Saudi fears and the fact that improved US-Iranian diplomatic relations will allow for cooperation against certain regional threats like the Islamic State in Iraq and Syria (ISIS), the US is not likely to drop its alliance with Saudi Arabia. Iran’s aid to Houthi rebels in Yemen has been detrimental to both the United States and Saudi Arabia, which has led to the US providing logistics and intelligence support to the Saudis. The current Saudi campaign in Yemen is more than likely a show of force, intended to both distract from the nuclear deal negotiations and to remind the US of its existing alliance in the region. As a result, Saudi Arabia will likely scale back its campaign in Yemen once the nuclear deal is finalized. The current situation, however, exemplifies the contradictory interests the US will have to consider in the region for years to come should the nuclear deal come to fruition. Thawing the icy relationship between the US and Iran that has persisted for the past 36 years has vast implications for future diplomatic and trade efforts. Whether or not the nuclear deal could bring stability to this historically turbulent region remains to be seen, but at the very least, the opportunity to negotiate with Iran as a legitimate state actor instead of dismissing it as a rogue state opens the door to diplomatic approaches to the bigger issues in the region: the sectarian fighting between the Sunni and Shia populations in Syria and Iraq, the Houthi uprising in Yemen, and the relationship between Israel and its Arab neighbors. The real challenge will be bringing to the negotiating table competing regional interests and finding diplomatic solutions to these problems. This article originally appeared on Ramen IR, an international affairs blog.